The history of the American Indian Horse is a long and colorful one. It is generally agreed by historians that the Spanish brought the horse to the new world in the 1500s. These horses were a mixture of Barb, Arabian and Andalusian blood and were considered the best horses in the world at that time. The horse was indispensable to the conquest of Mexico by Cortez. Indians of that era had never seen horses and to them the horse and rider team were a godlike being. To try and keep this belief, it was illegal for some years for an Indian to ride a horse much less own one. However, in time, with the spread of the horse and the Spanish ranchos, the Indian did acquire this “Big Dog” or “God Dog” for their own. The acquisition of the horse completely changed the Plains Indians’ way of life, transforming them from plodding pedestrians to nomadic hunters and warriors. The horse brought about a culture totally dependant upon themselves. 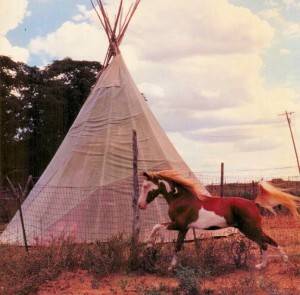 Before the coming of the horse, the Indian tribes had used dogs for carrying small portable shelters; after the horse arrived the portable shelters became large decorative tipis. Hunting took on a different form also. Before the horse the primary way of hunting was to run a herd of game over a cliff. After the arrival of the horse the Indians could hunt from horseback, choosing only the most desirable of targets for their prey. Horse stealing between the tribes became the number one sport on the plains and was considered an honorable way for a young warrior to gain experience and fame. Horses meant wealth to the Plains tribes and were used extensively for barter and gifts. Many religious ceremonies were based on the horse and its contribution to the life of the Indian. One of the most interesting was the horse medicine cult practiced by most Plains tribes. The Oglala Dakota tribe had an elaborate horse medicine cult which included a dance in imitation of horses. The Oglala used horse medicine to influence the outcome of horse races, to cure sick and wounded horses, to calm a fractious horse and to make broodmares have fine foals. Horse medicine men and women were among the most respected members of their tribes. In 1888, noted western artist and writer Frederic Remington said of the horse, “One thing is certain; of all the remnants the Spaniard has left to glorify his reign in America, there will be none more worthy than his horse … the Spaniard’s horses may be found today in countless thousands, from the city of the Montezumas to the regions of perpetual snow; they are grafted into our equine wealth and make an important impression on the horse of the country. They have borne the Moor, the Spanish conqueror, the Indian, the mountain man, and the vaquero through all the glories of their careers.” — HORSES OF THE PLAINS, Century Magazine. One of the most colorful episodes in the long career of the Indian Horse was the gathering of millions of wild Longhorn Cattle off the Texas ranges after the War Between the States. They swam every river from Texas to Canada, enduring stampedes, tornadoes, hailstorms, and freezing blizzards. They did it all while foraging on grass and brush without grain, and they came through it ready for more. And most of them weren’t much larger than the Longhorns they drove. The United States Army found, in its attempt to conquer the Indian, that the only way to effectively control these people was to take their horses away from them. Repeated instances of complete massacre of Indian horse herds is documented evidence – mute testimony to the toughness of this breed. They were better than anything the cavalry could put up against them. The Indian Horse has contributed to the making of a number of American breeds. The Morgan, Quarter Horse, American Saddlebred, and the Tennessee Walker are only a few, and most of the color breeds trace their ancestry back to the Indian Horse, the Paint, Palomino, Appaloosa and Buckskin to name some.